Keeping Big Cats As Pets ? Like puppies, big cats are quite appealing when they're young and playful. Unlike a puppy, however, a tiger, for example, can eat ten to 15 pounds (five to 7.5 kilograms) of raw meat a day and grow to more than 500 pounds (230 kilograms). Exotic Animals continue to appeal to millions of Americans, 18.2 million according to a recent National Pet Owners Survey. That's a 1.4 million jump since 2002, an increase that is probably understated since a good portion of this trade is illegal.In an attempt to evade permit requirements and local regulations, some owners keep their unusual pets a secret. There Are (811) of incidents involving captive big cats since 1990 till 2007. These incidents have resulted in the killing or deaths of 236 big cats, 74 human deaths, more than 253 human maulings, 214 exotic cat escapes and 366 confiscations. 67% of these numbers occur in the U.S. despite the fact that the U.S. makes up less than 5% of the global population and is not the native home of lions and tigers. Big cats such as lions and tigers are awe inspiring, beautiful animals. People are often intrigued by keeping big wild cats as pets, but what kind of pets do tigers, lions, bobcats, and other big cats make? Owners need to remember that even the smaller of the non domestic cats, such as bobcats, servals, and lynx, are not at all like domestic cats. Different species have different temperaments, but all of these cats can exhibit unwanted behavior from urine marking to aggression. Most of these cats will need spacious outdoor cages in order to thrive. It is a huge commitment and responsibility to properly care for smaller wild cats such as bobcats. The large cats such as lions, tigers, leopards, and cougars are even more problematic. Even if they are not overly aggressive, their natural tendencies must be remembered. They are predators, and even at play their huge size and strength makes them a threat. Many people do keep big cats like bobcats, tigers, and lions as pets. Tigers and lions are surprisingly easy and inexpensive to purchase as pets. This means anyone can own a large powerful carnivore whether or not they are equipped to properly care for them. Pet tigers have been involved in several fatalities and maulings in the US in recent years. However, even more pet tigers and other big cats end up neglected, abused, or given up to sanctuaries when their owners cannot care for them. I am certain that there are owners of big cats who go out of their way to provide appropriate housing and diet and have no problems, but there are countless others who are very misguided in their expectactions and ability to provide the proper care. Case in point: the man in Harlem who raised a pet tiger in his apartment.Properly caring for big cats costs thousands. One wildlife sanctuary estimates that the annual expenses of maintaining a big cat run about $8,000 (including food, vet bills, and medications), a fraction of the estimated $94,000 it costs to set up proper handling facilities. When private owners realize that they can no longer care for their high-cost exotic “pets” they turn to zoos or other rescue organizations to take over the responsibility. The Captive Wildlife Safety Act was introduced and passed in the US House of Representatives in 2004 to address the problems of availability of wild cats as pets. This Act prohibits the interstate and foreign trade in exotic cats, including lions, tigers, leopards, cheetahs, jaguars and cougars for the pet trade. Circuses, zoos, wildlife rehabilitators and some other licensed facilities are exempt. This legislation was introduced with the sole purpose of making these big cats unavailable to the pet trade, although it is not an outright ban on ownership. I am not sure how much of an impact this law would have, really, but it is a good start in reducing the ownership of pet tigers, lions, and other large cats. 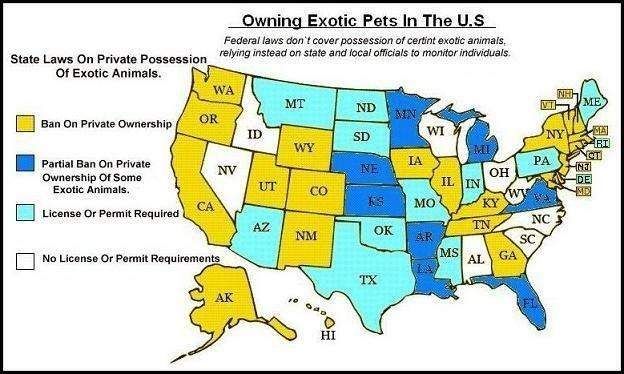 It started in 2003 with a law to ban the sale of big cats across state lines as pets. Since then eight states, including AR, IA, IN, KY, LA, MD, NY and WA have banned the keeping of big cats as pets. Three countries including Africa, Australia and Ireland and 12 communities in Canada have banned the keeping of big cats as pets. Five countries, including Brazil, Croatia, India, Scotland, the UK and 20 communities in Canada have banned circuses that use big cats in their performances. In the United States, 19 states have banned ownership of big cats and other dangerous exotic animals as pets, and the Captive Wildlife Safety Act bans the interstate sale and transportation of these animals. The Captive Wildlife Animal Coalition estimates that there are nearly 7,000 tigers living as private pets in the United States. When all species of exotic felines are considered that figure jumps to nearly 20,000 It is estimated that there are only about 5,000 left in the wild. 12,000 tigers are being kept as private pets in the USA, significantly more than the world's entire wild population. 4,000 are believed to be in captivity in Texas alone according to an Association of Zoos and Aquariums estimate. The Exotic Feline Rescue Center fields about 36 rescue requests per year. Those abusing exotic animals or violating their own state’s laws usually get very little time behind bars. One rescue came from a drug dealer in Indiana who was running a meth lab. Another from a child molester. In both instances they were able to keep the criminals behind bars longer by prosecuting them on drug or abuse charges. Keeping wild cats such as tigers, lion, bobcats and cougars may be illegal where you live (either under local laws or by wider regulations. You will need to find a veterinarian that is willing to treat your wild cat (not easy!). All big (wild) cats have sharp claws and teeth and can be quite destructive. Large cats eat massive quantities of raw meat (expensive). 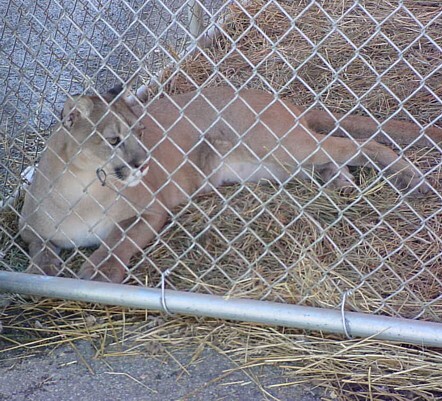 Big cats need a lot of space, and usually custom built cages, even smaller species like bobcats. You will need to provide lots of intellectual and physical enrichment opportunities, much like a zoo, for your wild cat. Big cats tend to spray (urine) and they have a real musky odor! According to Responsible Exotic Animal Ownership, an animal owners' rights group, your lifetime odds of getting killed by a big cat is 1 in 4,000,000. You're more likely to meet a pit bull or a bee. You can buy a tiger on the Internet for $100.00, research-averse activists proclaim in horror. Just try to order up a tiger online, or even a serval. You won’t succeed. This urban legend has great repeatability at cocktail parties and save-the-cute-animals-from-evil-humans fundraisers, but is severely lacking in the reality department. Breeders do have web sites, but it takes much more than a click of the mouse to purchase an exotic cat. Many people wonder why anyone in their right mind would want a lion (or a tiger, or a cougar, etc.) as a pet. After all, aren't the great cats hardwired, vicious killing machines? Isn't injury or death by these creatures an inevitable outcome of keeping them? Must they at all times be isolated from us by thick bars and strong fences? Arguably, the great cats are among the most powerful, beautiful and magnificent creatures that walk planet earth. Although it could be claimed that this alone is enough reason to justify owning one of these animals, there is actually a far deeper reason-- and a very surprising one to the uninitiated-- to have these animals close at hand. Humans have a number of basic needs. Most of these we are familiar with: food, shelter, water, etc. But, there is one fundamental need that is often overlooked, as it is not often portrayed as a basic survival need. That is the need to connect to another living being in a spiritual way. The most relevant example of this is the bond between husband and wife in a good marriage. But, it goes far beyond that. One can have a deep relationship with a friend, but never have (or need) the physical part of that relationship that would come with marriage. A person can have a relationship to a higher being-- and many people do. In fact, the teachings of most religions will lead the believer from a rote following of rules to a functional, abiding relationship with this higher being. And this relationship is intangible by our physically based standards. Last, but not least, a person can have a bond with an animal or animals. What is special about animals? Looked at from a purely religious standpoint, animals were created by a higher being and were put here for a number of purposes. One of these purposes was to form relationships with humans, to be, as it were, our close friends. Generally, the animals that draw people into relationships are the higher animals: horses, elephants, dogs, cats, lions, tigers, etc. However, this bonding can occur with lower animals as well. Someone I know recently had their pet snake die on them. Now, most of us don't think too highly of a snake, perhaps the lowliest of all the reptiles. But, this person was crushed by the loss of this snake, and it had a noticeable effect on them emotionally for some time. So, if this kind of bonding can happen with a snake, imagine what it must be like for a tiger? Indeed another friend of mine who recently lost a lion described the experience 'like losing a child'. What is it we see in animals that causes deep relationships to form? A lot depends on your worldview. For me, it is in their spirit. It's hard to deny that animals have spirits. Indeed, the Christian bible talks about the spirits of animals, and how they form a part of the compartment in which we exist. But, what is the proof of this? In most cases, it is something deeply personal, and purely experiential. It is something we cannot measure or quantify, or systemize (especially from a legal standpoint). Briefly, here's my experience that helps me draw this conclusion. Some years ago, a lion died. This lion was special to me, as he had an incredibly deep bond with his keeper. They were literally and figuratively, the best of friends. But, even lions die eventually, and this lion died a terrible, lingering death of cancer. I did not know this lion or his keeper personally. But I mourned for weeks over the loss of this lion and the special relationship he had with his keeper. One sleepless night during this time, while I laid in bed with this issue and a lot of other thoughts on my mind, God let me meet the spirit of this lion. It was a stunning, life-changing experience. I learned two really critical things from this experience: First, animals do indeed have functional spirits (but not to the degree we do) that do not die with their bodies, and animals are a channel of God's pure love. Shortly after this happened, I finally got a copy of a book I had been waiting for (and contributed to in a small way), 'To Walk With Lions' by noted lion researcher Gareth Patterson. This book corroborated my experience with some similar experiences that Gareth and his friends had experienced. Also, about that time, a friend of mine was beginning to research this very topic. He, too, had such an experience, in this case with a dying bobcat. This experience motivated him to devote his life to the conservation of our wild cats. And, it has kept him focused on this goal through and good times and hard times. If you go to any bookstore, you will see shelves lined with books on animal spirituality. Animals have both a profound and well-documented physical, as well as psycho-spiritual effect on most animal owners. Armed with many independent validations of my experience, I began to understand what it is with animals, especially the higher animals that draw us into such deep bonds with them. First of all, the basic need to connect exists in animals, as well as in humans. It apparently is an essential part of life. Many scientists argue that animals are basically hardwired robots that are programmed to survive, and do little else. One article I remember reading said that the typical large animal has about as much computing horsepower in their brain as a '286 microprocessor (remember those?). These scientists reason that any behavior we see in animals, including those we 'confuse' with emotions, are nothing more than different manifestations of that will to survive. However, don't tell this to an animal lover. They will clearly demonstrate to you, through experience that these theories of animal behavior are dead wrong. (how can you measure love and trust in a laboratory?) In fact, some scientists are just now waking up and beginning to realize this. One scientist, who has been researching human as well as animal interrelationships even has gone on record as saying that 14 of the 16 basic human emotions are also active in animals. So, why big cats? Why not a dog instead of a leopard? Surely, a dog must be able to meet our needs to bond as well as a leopard, if this 'need to connect' is inherent in all animals? How many of you out there are married? Or, looking for 'Mr./Mrs. right'? How many of you married the first person you dated, or met? How many of you selected a mate at random, or had someone do this for you? We, as humans can't just bond with any other human that happens to come our way. There is usually a long, drawn-out selection process before we commit to a relationship. The same goes with animals. Some people might (as illustrated earlier) be fulfilled by a relationship with a snake. For many a dog or cat or bird will do. (But not just any dog, cat or bird. Look how different many species of each we have.) For some it takes a horse. For others, a lion. For the very reason that we aren't denied choice in whom we marry, we should not be denied that choice in whom we bond with from the animal kingdom. A person should have the freedom to bond with that animal that best fulfills them. In fact, such bonding should be encouraged and supported by our society, rather than being constantly questioned. Now, back to the opening paragraph of this essay. What do we see in the big cats that attract us to them? Unfortunately, many are initially attracted because of their power, and reputation as killers. However, one quickly learns that a properly raised big cat is just the opposite. They can be unbelievably affectionate. They can sense your emotions, and provide all the wonderful qualities we see in a domestic cat, but in a really big way. And, when you spend enough time around them, you will begin to sense how incredibly spiritual these animals are (especially lions!). Although you must never forget these are large predators that can kill effortlessly if provoked, people who have this degree of bonding with their cat rarely get hurt. (The statistics show the vast majority of cat-related injuries happen to those who have custodial care of these animals (zookeepers, hired help, etc. ), as opposed to an abiding relationship.) Indeed, there are now four instances I know of where a lion has gone out of its way to save a human life. Tigers have two instances of human rescue to their credit that I am aware of. Many more cases of this kind of altruism undoubtedly exist. This principle works from the cat's perspective, as well. They choose their favorite humans. And, they can become very jealous of their 'human'. For instance, at the zoo I volunteer at, three of the four lions have bonds with me. The big male has the deepest. Occasionally, I even get the chance to sleep near him, and he will stay by my side all night long. But, the fourth lion, and our two tigers don't have much to do with me. We also have a liger, which 'adopted' me. He wants me to be around him as much as possible, and gets noticeably upset when I leave. Other volunteers have a different, but similar experience. Some of the cats that aren't real social to me will fawn all over them, while some of 'my' cats all but ignore them. Every keeper has a different group of the same 7 cats that likes/ignores them. So, what does this all boil down to? Love. The most cherished of all emotions, and the one that draws us into close relationships more than any other. As I see it, it's no mistake that a higher being has chosen to make animals an outlet of this all-important quality. After all, although animals can show emotion in a very deep way, they do not have all the 'baggage' us humans seem to carry around with us. Therefore, the love we see in animals is very pure. Unspoiled. It draws us to them. It is said that many people come to work with animals because they have emotional problems. Among the animals, they can find strength and healing. And for some, it might take the love of a lion or a tiger to minister to that emotional need. It is a big love, a special love. Pretty soon, you find the cat is your 'best friend' and vice versa. It becomes immaterial that they are a super predator. (Although basic safety must always be practiced, as their protective instincts still function very well.) Such abiding relationships are truly spiritual in nature, as it is relationship that is the very basis of what we call religion. To deny this kind of a relationship to a person 'because they are inherently dangerous animals' is downright criminal. In fact, it is a direct violation of our right of free practice of religion. I can tell you firsthand. There is nothing in all the world better than the love of a lion! This paper, and a number of other interesting papers can also be found at www.tigertouch.org/library.html There are also some interesting papers on my website at www.lionlamb.us/lionwrit.html. From the book 'Who Am I The 16 Basic Desires That Motivate Our Actions and Define Our Personalities' by Steven Reiss, a professor of psychology and psychiatry at Ohio State University.